Palm trees are one of the most popular choices for indoor plants to grow. They provide the majestic beauty of a tropical garden and the ease of care is attractive. Mature palms adorn places like hotels and stately homes and foyers. They provide a tropical atmosphere and warmth to any place they reside. The less mature palms can sometimes be used as a desk plant for a small office and even in the bathrooms of some homes. Believe it or not, there are ways to tell an unhealthy tree. As much as you may feel sorry for it and want to take it home, you may want to think twice because it may not last a week. Some of the earmarks of an unhealthy tree is smelly soil, soggy soil, too many dead leaves and too stretched looking. 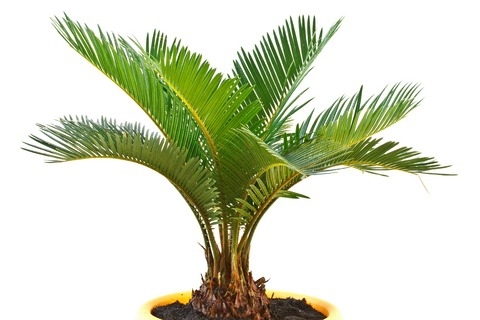 It is actually smarter to get a smaller and more compact plant than a taller and more overgrown palm. Look for mealy bugs which destroy the palm. They are found on the underside of the leaves and look like small cottony dots. There also may be tiny speckles that are spider mite damage. If you see roots growing out of the pot this could indicate that the plant is growing well. As an example we will use one of the most popular palms which are the Areca Palm. When the palm is still newly planted you will have to keep the soil around the roots moist and water once or twice a week during hotter and dryer weather. If you have your palm in a container keep the soil evenly wet but not drenched. The humidity must be as high as possible so you may want to keep it on a pebble tray or mist it occasionally. The soil that the Areca palm prefers is rich, acidic, fertile and well-draining soil. Though the palms are generally great indoor plants they still, by nature, will prefer bright light. The most ideal way to make sure you are getting enough indirect sunlight to your palm is to make sure they are placed by a window or under as skylight so that enough light hit the palm fronds. Continuous low light weakens the plant. This is because, just as sunflowers will move themselves to face the sunlight, all plants will actually stretch naturally to find the sun and get enough. Indoor palm trees are not full shade plants. Very few will do well in that condition. In too low light a situation, your palm is actually prone to parasites. Fortunately, indoor palm trees like the heat. In most indoor situations, finding sufficient warmth for survival is not an issue. You must be careful though that you don't develop leaf damage and possibly root damage by exposing them to too much dry heat. Make sure you don't place the palm by heaters or radiators as well as air conditioning units and vents. Make sure the room is heated enough during the cold winters. It is best not to expose them for an extended period of time for the sake of the longevity of the palm. You can keep them at room temperature for most of the year but in the winter 50-55°F is good. Palm trees and plants are by nature tropical. That means they are used to heavy storms and torrential rains, even hurricanes and tropical storms. So, in saying that, make sure they are watered well but at the same time, make sure they are not sloggy and drowning in water because they will rot. Another thing to be aware of is the drainage saucer under the pot that catches the extra water should be emptied each time the water is drained through. This is because the roots do not like sitting in standing water either. A good way to test the soil is poking your finger into the top inch. If it is dry then water. One of the most common issues of keeping indoor palm trees is the burning of the roots when too much fertilizer is used. When a palm is outdoors it needs more fertilizer. But when it is root bound and are exposed to less heat and less light it needs far less. Here is a good rule of thumb: 1-2 teaspoons for a 6 inch pot and 1-2 tablespoons for a gallon palm container. You need only do this 3-4 times a year. Make sure the grauals are spread evenly and watered in. In order for a home to be ideal for a lot of palms you would have to keep your home at a 50% higher level than normal. This is not realistic as mold and mildew would grow everywhere and as this would be comfortable for the plants, it is not so comfortable for the humans. What you can do it to use a humidifier to keep the air surrounding the plant humidified. It is a best practice to rotate your palms outdoors once in a while to prevent mites and bugs as well as to encourage good transpiration and photosynthesis. Insects and mites can be controlled with misting and insecticidal soap if necessary. Do not over prune the leaves. Only take away brown or unhealthy leaves. The palms draw nutrients from their leaves. Monitor the growth once a year so you can re-pot adequately. Eventually it will grow slower, needing to be re-potted every two years. Server responsed at: 04/25/2019 4:55 a.m.